California co-author Beverly Knauer earned her bachelor's degree in occupational therapy from the University of Wisconsin-Madison then moved to San Diego, California, where she served in the role of Chief of Rehabilitation Services for the County of San Diego, working with other occupational and physical therapists who provide therapy to children with special needs. She continued her education with a master's degree from San Diego State University. ‘I've always loved exploring esoteric wisdom and chose to become a writer to communicate transformative life experiences in the form of visionary fiction. California co-author Murray Rosenthal is a world-renowned, board-certified psychiatrist, researcher, and lecturer. Even after a thirty-year career as a psychiatrist he’s managing a farm in Fiji and mentoring young entrepreneurs in the medical arena. He thrives on adventure and travelling and through his travels he has seen firsthand the profound changes our planet is experiencing, and he feels an urgency to rectify the situation. 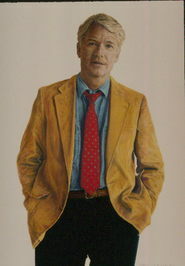 He has been a lifelong science nerd, especially in regard to up-and coming technologies. 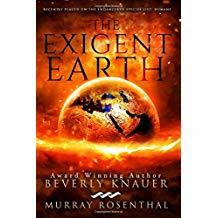 THE EXIGENT EARTH stands among the more important psychodramas of late – the story is beautifully crafted, the characters and situations are mesmerizing, and the kick-in-the-gut message is one the reader will not forget.